Hotel Heavens is a deluxe property whose name falls in harmony with the place where it is situated, Haridwar which is also known as The Gateway to Lord Vishnu. The hotel promises a comfortable and luxurious stay in the well furnished rooms. The guests are welcomed with a friendly smile assuring a nostalgic stay at the deluxe hotel. The hotel is nestled with love in the holy city of Haridwar. The hotel is strategically situted at the natural utterance of Ganga Ghat Prem Nagar Ashram. It is only steps away from NH-58, Ganga Ghat of Prem Nagar Ashram. It is easily accessible as it is located in the heart of holy city. The hotel offers accommodation in (30) well appointed fully air conditioned rooms. The guests can make themselves comfortable at the perfectly fashioned rooms, well ventilated rooms. All the room are well equipped with modern amenities such as hygienic bathrooms, 24 hours hot/cold running water, 100% power back-up and free wi-fi enabled internet. The hotel also offers room service and free dormitory for drivers. The multi cuisine vegetarian restaurant of the hotel seves freshly prepared authentic cuisines. The guests can feast on delectable Indian, Chinese and Continental cuisines which are prepared by the experienced chefs. The experience of having finger licking food in the warm and friendly ambience of the hotel is exhilarating. - Above prices are applicable on per room per day on twin sharing basis. - A net discount of 15% can be offered on above tariff. - Extra taxes applicable as per government rules. - Special discounts up to 15% on group tours and travel agents for bulk bookings. - 100% Refund of the deposited advance if cancelled before 15 days of the arrival. - 50% Refund of the deposited advance if cancelled before 10 days of the arrival. - 25% Refund of the deposited advance if cancelled before 07 days of the arrival. - No Refund of the deposited advance if cancelled with in 07 days of the arrival. 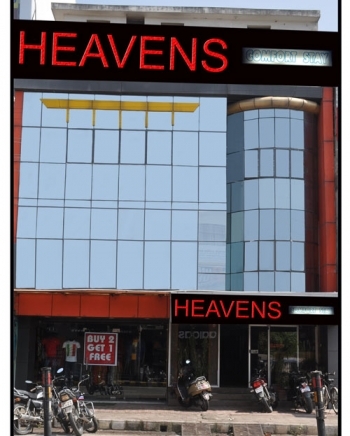 Hotel Heavens is situated in the holy city of Haridwar in Uttarakhand. It is located near Prem Nagar Ashram Ranipur. One can easily reach Haridwar as it is well connected to cities such as Chandigarh (205km), Delhi (210km), Dehradun (59km) and Nainital (223km) through a good network of roads. Haridwar being a famous pilgrim place has a great connectivity of motorable roads from various destinations in India. State owned buses as well as private buses operate from Delhis ISBT Kashimiri Gate to Haridwar. Railway station and bus stand are located close to the hotel at a distance of 200 metres only. Haridwar is well connected with railways by metalled roads from major cities in India. Jolly Grant Airport is the nearest airport from Haridwar. It is well connected to Delhi with daily flights. Taxis are easily available to Haridwar from Jolly Grant Airport.